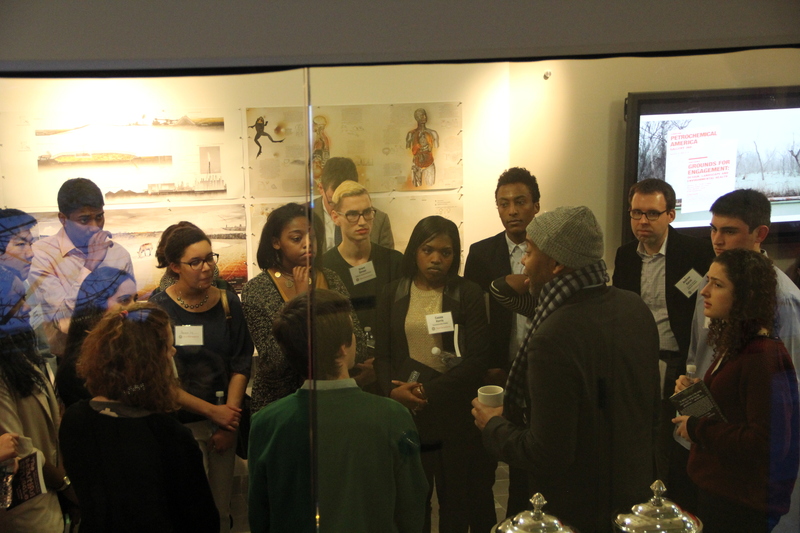 Ta-Nehisi Coates speaks in the 2015 Scholars Seminar. Carey Rappaport serves as an Associate Director of the Bernard M. Gordon Center for Subsurface Sensing and Imaging Systems. Rappaport has been a professor at Northeastern University since 1987, mentoring scores of undergraduate researchers along the way. He received dual SBs, SM, and Eng from MIT in 1982 and the Ph.D. from MIT in 1987. Rappaport's research has focused upon developing and integrating electromagnetic, acoustic, and optical sensing technologies to detect hidden objects and to use those technologies to meet real world subsurface challenges ranging from humanitarian demining to noninvasive breast cancer detection. Professor Rappaport is also a Faculty Fellow of the University Scholars Program. 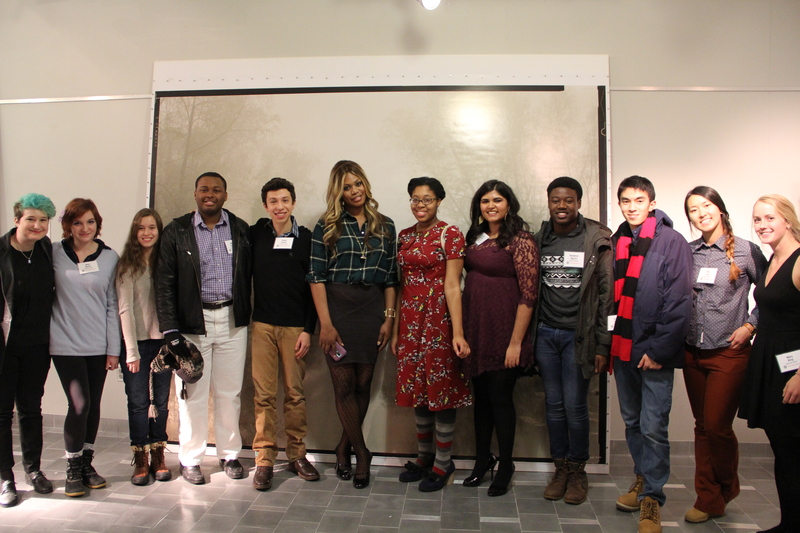 Scholars meet actress and advocate Laverne Cox. 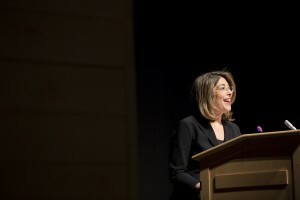 As leader of the team that selects each year's new University Scholars, Liz Cheron offers insight into the college admissions landscape generally, as well as the goals and structure of the process that brought audience members to Northeastern as University Scholars. Cheron is a graduate of Boston College and holds an M.Ed. in Higher Education Administration from Northeastern. Professor Meyer is widely published in the field of product, service, and business model innovation and has worked with industry leaders in computing, industrial products, and consumer products around the world. He has also taken a leadership role in developing new methods for teaching entrepreneurship and has helped numerous students start their own ventures. Dr. Meyer is the founder of D'Amore-McKim School of Business’ Entrepreneurship and Innovation Group and Co-Director of the Center for Entrepreneurship Education, which combined education, incubation, and launch into a single, experiential learning system for undergraduate and graduate students from across the University, as well as alumni. Students meet with Ta-Nehisi Coates prior to his public lecture. A national correspondent for the Atlantic, Ta-Nehisi Coates has penned many influential articles, including a 2014 cover story on slavery and race, “The Case for Reparations,” which became one of the most talked-about pieces of nonfiction in recent memory. Last year, Coates’s lively Atlantic blog was named by Time as one of the 25 Best in the World. Professor Kirda's research interests are in systems, software and network security, with a focus on Web security, binary analysis, and malware detection. He directs Northeastern's Information Assurance Institute. Previously, he has worked on distributed systems, software engineering and software architectures. Before coming to Northeastern, Professor Kirda taught at Institute Eurecom (France) and the Technical University of Vienna, where he co-founded the Secure Systems Lab. Professor Auerbach is Associate Director for Policy at the Centers for Disease Control and Prevention (CDC), as well as Director of the Institute on Urban Health Research at Northeastern. From 2007 to 2012 he was the Massachusetts Commissioner of Public Health. As Commissioner he oversaw a Department with 3,100 employees and 100 separate programmatic units including those addressing chronic and infectious disease, substance abuse, environmental health and emergency preparedness. He initiated the Mass in Motion initiative, a multi-faceted campaign to prevent obesity and promote wellness. He was a member of the team that implemented the state’s groundbreaking health care reform initiative. Prior to his appointment as Commissioner, Auerbach had been the Executive Director of the Boston Public Health Commission for 9 years.Under his leadership, the Commission developed new initiatives on tobacco control, cancer, asthma, obesity, emergency preparedness as well as a broad-based and comprehensive campaign to reduce racial and ethnic health disparities. Mr. Auerbach had previously worked at the State Health Department for a decade, first as the Chief of Staff and later as an Assistant Commissioner overseeing the HIV/AIDS Bureau. He began his career in public health as an administrator in the Uphams Corner Community Health Center and a manager at Boston City Hospital and the Boston University School of Medicine. Jose Antonio Vargas, Journalist, Filmmaker, Founder of "Define American"
Maulsby’s research focuses on architectural responses to modernization with a special emphasis on the relationships between architecture, urbanism, and politics in Italy. Her book Fascism, Architecture and the Claiming of Modern Milan, 1923–43 was published by the University of Toronto Press (2014). This project was funded by a number of fellowships, grants, and awards including a Whiting Fellowship and a Mellon Author Award. Her articles and reviews have been published in Urban History, Journal of Architectural Education, and in City Halls and Civic Materialism: Towards a Global History of Urban Public Space (edited by Swati Chattopadhyay and Jeremy White) and are forthcoming in Future/Anterior and The Journal of the Society of Architectural Historians. Her current book project Modernism in Postwar Italy considers the legacy of Fascism in the postwar period and has been supported by a Wolfsonian-FIU Fellowship and Franklin Research Grant. Stephen Intille's work explores the development and evaluation of personal, behavioral health informatics – how sensor data acquired throughout everyday life from miniature mobile and in-home sensors might be used to improve wellness via novel human-computer interfaces. This research involves merging ideas from the computer science subfields of pattern recognition, machine learning, computational sensing, and artificial intelligence with ideas from behavioral science, behavioral medicine, social psychology, and preventive medicine. Intille is particularly interested in how algorithms that recognize everyday activities can drive the development of interactive preventive health tools that could ultimately be applied at the population scale in a cost-effective manner. Intille directs the mHealth Research Group at Northeastern, which has worked to create new tools that can be used to both measure and motivate behavior change, taking advantage of emerging sensor-based technologies. Professor Kaplan's newest book is Miss Anne in Harlem: The White Women of the Black Renaissance. Little could be more unusual in the 1920s than for white, upper-class women to seek to become, in effect, honorary blacks. Miss Anne in Harlem is the first book to tell the story of a number of spirited white women who did just that, crossing race lines viewed as impenetrable to play seminal roles in the great black cultural movement of the early twentieth century that came to be called the Harlem Renaissance. Often viewed with suspicion by people on both sides of the color line, these women were patrons and participants, friends and sometimes lovers—and frequently lightning rods for controversy as their motives for embracing blackness were misinterpreted, misrepresented, and derided. Kaplan's engrossing group biography gives these women their due, exploring the intentions, contributions, and lasting significance of six iconoclasts who left their mark on an emerging black cultural shift. 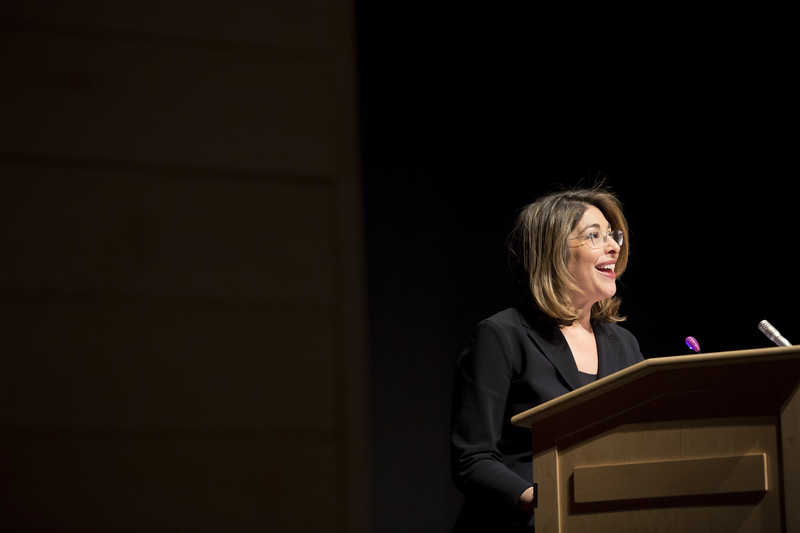 Naomi Klein concludes the 2015 Scholar Seminar. Klein’s previous book, The Shock Doctrine: The Rise of Disaster Capitalism(2007) was published in 30 languages and has over a million copies in print. It appeared on multiple “best of year” lists, including as a New York Times Critics’ Pick of the Year. Klein’s first book No Logo: Taking Aim at the Brand Bullies was also an international bestseller, translated into over 25 languages with more than a million copies in print. The New York Times called it “a movement bible.” In 2011, Time magazine named it as one of the Top 100 non-fiction books published since 1923.